Thanks to everyone who has let us know which new kit items they hope to order this year. It looks like we’ll get the 25+ quantity discount for our bibs and jerseys. We’re close to the 6+ quantity discounts for most of the other items. Then on Monday, our Jakroo Storefront will go live! The store will be open for 2 weeks to place your real order. At the close of the 2-week window, Jakroo will confirm our price discounts based on our actual orders. Then they will begin production of each and every order, sending them directly to you when completed. This will take about 2-3 weeks. You can find the Storefront link on our own website ON THE CLOTHING PAGE. 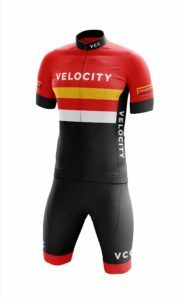 If all goes well, I’m hoping we can all kit-up in the new design just in time for our own club’s races (ITT and Crit) on the May long weekend. Volunteers are needed to marshal the Spring Series on April 14 and 28th. Without enough marshals there will be no racing. I’ll be sweeping through the B group this week to ensure everyone races fair and safe. Please, NO CENTRE-LINE VIOLATIONS!! Sign-up as a volunteer on the Spring Series Signup Sheet [CLICK HERE]. This month’s meeting is Thursday April 18 at 7pm, in the MEC Downtown Community Boardroom. Please join us to help firm-up this years riding schedule. The annual 81″ Cup Track Meet starts at 9am on April 28. This is a fun day of racing, with no one allowed to race in a gear larger than 81 inches – a 48×16 gear combination. This will be better than the Spring Series – because you get only one chance to win a Spring Series race. In the 81″ Cup, you’ll have 4 or 5 races to try out your winning tactics! Racing on the velodrome is also much more spectator-friendly than the Spring Series … so come on out and watch if you won’t be racing! What’s your biggest road block this season? Remember to book a Friday Quick Spin Coaching Call this season. I’m keeping most Friday afternoons open to have a quick chat. Coach Kevin is facilitating another ABA Learn To Race Clinic this day. But you will find plenty of experienced club members ready to lead this ride.